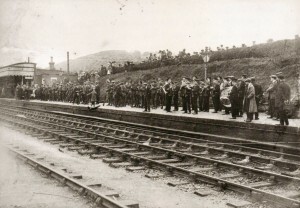 Dorking, like other towns, villages and cities all over the world commemorated the Centenary of the First World War. 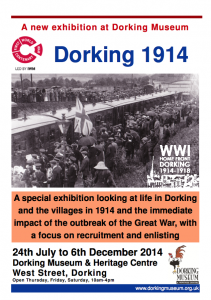 We had panels on the issues that affected the people of Dorking in the first few months of the war. 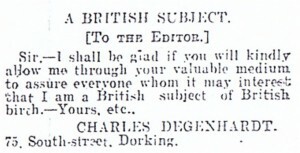 From the anti-German feeling around Dorking, that caused the owner of Degenhardts store on South Street to have to write to the Dorking Advertiser explaining although he had a Germanic name – he was English by birth and not to boycott his shop to news that the local football team could only continue to play of they gave all their receipts to the Prince of Wales relief fund. 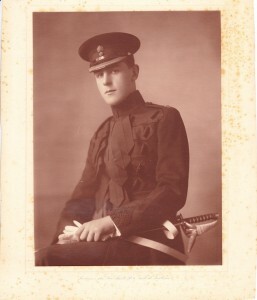 The exhibition featured display panels in the Museum’s temporary exhibition space, and also spilled in to all areas of the permanent exhibition, showing how the war affected all aspects of town life. 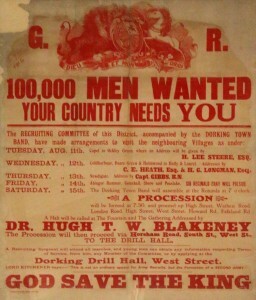 Outside the museum, there were recruitment posters and biographies of some of the town’s major recruiters and those who enlisted. For more information on the contents of the Exhibition, please click on each link. 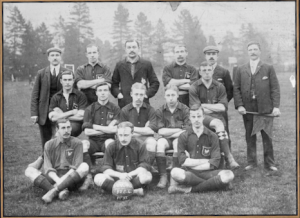 Dorking 1914 – A Volunteer Army? These smaller pieces of information are placed all over the Museum. We have a dedicated First World War loan box for use in schools. Please have a look here for more details.